Fairy Tail likes to think it is sneaky, but there are a few things the series can not hide. For instance, a pregnancy isn’t easily overlooked, and it looks like Fairy Tail tried to slip a major teaser about one couple just recently. It’s a good thing manga fans are used to looking into things. How else were fans supposed to catch on Levy otherwise? Not long ago, Fairy Tail: 100 Years Quest put out a brand-new chapter, and it was there fans caught up with Natsu. The gang are still dealing with a local Water God Dragon while the Fairy Tail guild learns all about the White Mage. Its interior pages are plenty tense, but the chapter’s cover page is what piqued fans’ attention the most. As you can see above, fans were shown an image of Levy and Gajeel in a local bookstore. The pair are in civilian clothes, but Gajeel looks confused as he stares down at Levy. His cocked brow is easy to focus on, but fans will want to take a closer look at Levy. 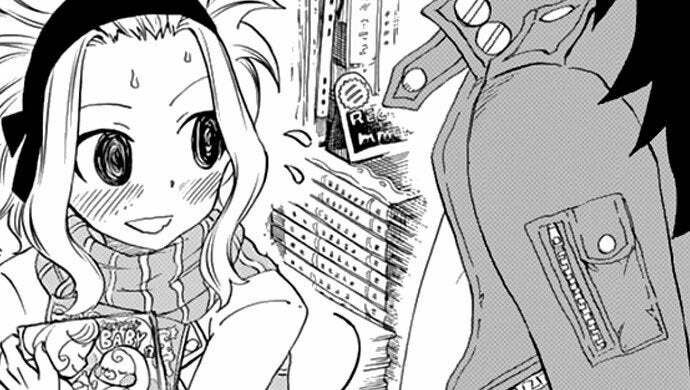 The heroine is sweating under Gajeel’s close gaze, and her blush is even more curious. Oh, and she just so happens to be holding a book about babies. It’s good to know her local bookstore has a guide on pregnancy because it looks like the mage is going to need it. Fairy Tail might not focus on Levy’s blooming romance with Gajeel, but it seems its sequel is taking the couple to a new level. The franchise has teased the family’s expanding family in previous spin-offs, but this mainline sequel seems like it will document the ordeal from pregnancy to birth. Now, Levy needs to find a way to inform her lover they’re expecting, and fans can only imagine how Gajeel will take the news. So, are you happy for this cute couple? Let me know in the comments or hit me up on Twitter @MeganPetersCB to talk all things comics and anime!